January 9 UPDATE (3 p.m. Pacific): Only 2 days left, but we've attained our $100,000 goal—that means all those who made or make a donation of $17 or more for the entire bundle will also be receiving bonus content only available from Humble Bundle: APOSIMZ (the prologue chapter from Tsutomu Nihei's new manga series), an exclusive Nihei video, and the Science Fiction Manga by Nihei: Collected Works digital art book! 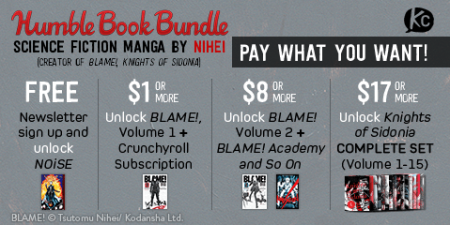 Kodansha Comics presents the Science Fiction Manga by Nihei book bundle in partnership with our good pals at Humble Bundle. Now we are offering $185 worth of digital manga, including legendary manga-ka Tsutomu Nihei’s early mind-benders BLAME! and NOiSE up to his masterpiece, Knights of Sidonia. The cost of the bundle? You can pay what you want! Name your price. Together, the books in this bundle usually cost as much as $185. At Humble Bundle, though, you choose the price! Support charity. Choose where the money goes—between Kodansha Comics, three charities (Comic Book Legal Defense Fund, Worldreader, and Mental Health Foundation), and, if you'd like, a fourth charity of your choice via the PayPal Giving Fund. For details on how this works, click here. If you like this bundle or like what Humble Bundle does, you can leave a Humble Tip too. This special bundle ends WEDNESDAY, JANUARY 11, 10:59 A.M. PACIFIC TIME. Unlock NOiSE, a prequel to BLAME! Unlock all of the above + BLAME! volume 2 + the never-before-published-in-English BLAME! Academy and So On, a spinoff of BLAME! 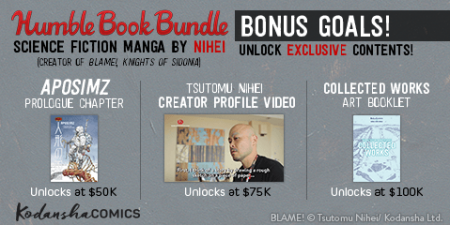 BONUS GOALS = EXCLUSIVE NEW CONTENT Help us reach our bonus goals and unlock never-before-seen new work from Nihei! A prologue chapter from Nihei’s next manga series. Unlock at $50K. Art booklet. Unlock at $100K. Media: Click here for the official press release. Watch the video of Nihei drawing Tsumugi from Knights of Sidonia. This video was taken during the reception of Nihei's original design toy exhibit at BAIT store during SDCC 2016. So whaddya think of the BLAME! 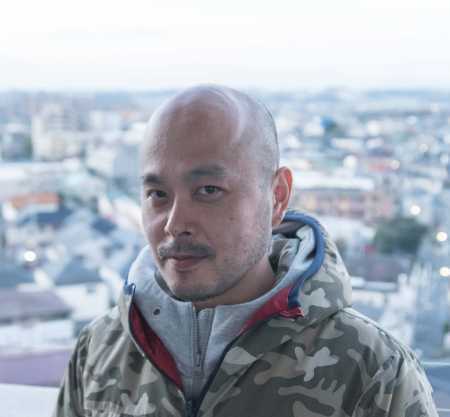 T-shirt Nihei was wearing in the video? 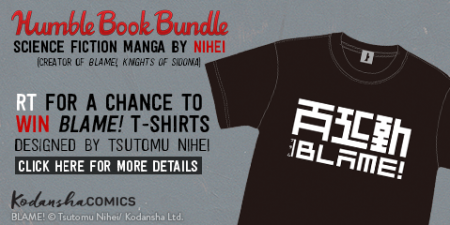 Actually, it’s a special T-shirt Nihei himself designed for his clothing brand, Toha Heavy Industries—and now we’re offering you the chance to win it! THIS SWEEPSTAKES ENDS WEDNESDAY, January 11, 10:59 A.M. PACIFIC TIME. 1. To join the contest, log in to your Twitter account and retweet @KodanshaUSA's original post about the contest. 2. After January 11, 10:59 A.M. PACIFIC TIME, we'll randomly select 10 winners from the list of people who RT'ed. 3. We'll contact the 10 winners individually via Direct Message and ask for T-shirt size and shipping address. 4. Contest is open to U.S. and Canada residents ONLY.